"Famous Impostors" is the fourth and final book of nonfiction by Bram Stoker, published in 1910. 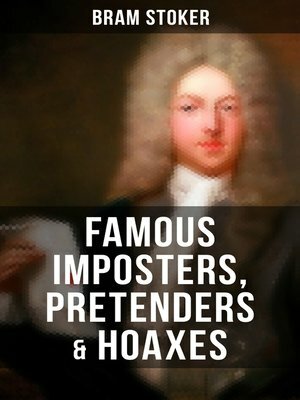 It is a book that deals with exposing various impostors and hoaxes. Contents: Pretenders Perkin Warbeck The Hidden King Stephan Mali The False Dauphins Princess Olive Practitioners of Magic Paracelsus Cagliostro Mesmer The Wandering Jew John Law Witchcraft and Clairvoyance Witches Doctor Dee La Voisin Sir Edward Kelley Mother Damnable Matthew Hopkins Arthur Orton (Tichborne claimant) Women as Men The Motive for Disguise Hannah Snell La Maupin Mary East Hoaxes, Etc. Two London Hoaxes The Cat Hoax The Military Review The Toll-Gate The Marriage Hoax Buried Treasure Dean Swift's Hoax Hoaxed Burglars Bogus Sausages The Moon Hoax Chevalier d'Eon The Bisley Boy... Abraham "Bram" Stoker ( 1847 – 1912) was an Irish novelist and short story writer, best known today for his 1897 Gothic novel Dracula. During his lifetime, he was better known as personal assistant of actor Henry Irving and business manager of the Lyceum Theatre in London, which Irving owned.